The property’s owner, Jamestown, announced last week that New Tradition, has signed a master lease agreement for the new digital signage currently being built at One Times Square. As the master signage lease holder, New Tradition will seek brands to advertise on the property’s displays. 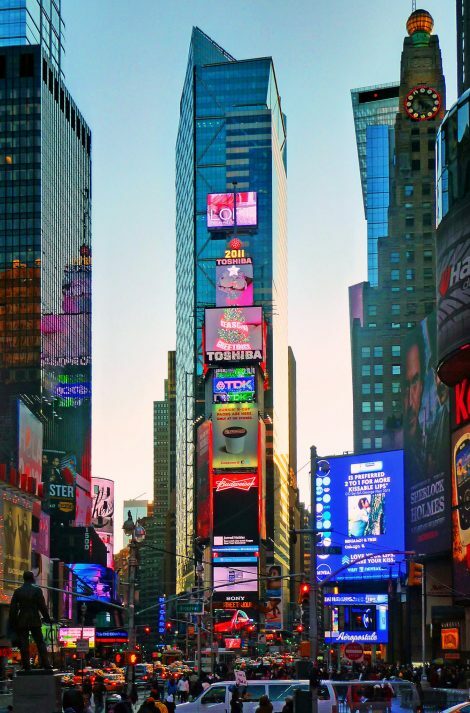 Expected to debut this summer, the new 350-foot-tall digital signage will provide brands with the opportunity to create compelling advertising campaigns that will stand out from the numerous billboards in Times Square. Options will include full takeovers of the iconic facade and the ability to “choreograph a show” across several signs for a new type of theater in the heart of Times Square. One Time Square is one of only two stand-alone buildings in the neighborhood offering clear, unobstructed sightlines from all points within the Times Square ‘bowtie’ – an area which encompasses Broadway and Seventh Avenues from 43rd Street to 47th Street. With a daily pedestrian count of more than 350,000 and millions of earned impressions from film, TV, and social media, the property is one of the most visible and recognizable locations in the world, offering brands a global stage to engage with their audience. Jamestown, L.P. was established in 1983 as an investment and management company focused on income-producing real estate in the United States. Over the last 35+ years, Jamestown has grown its portfolio of assets in key markets throughout the U.S. and expanded its investment footprint to South America and Europe. Jamestown’s capabilities include: acquisitions, capital markets, property management, asset management, retail leasing, design, sustainability, and risk management. Jamestown has headquarters in Atlanta, GA and Cologne, Germany, and offices in New York, NY, Boston, MA, Washington, DC, San Francisco, CA, Los Angeles, CA, and Bogota, Colombia. This entry was posted on Monday, April 15th, 2019 at 02:21 @140 and is filed under DailyDOOH Update. You can follow any responses to this entry through the RSS 2.0 feed. You can leave a response, or trackback from your own site.